The addition of pedestrian refuge islands and bike lanes narrowed Brooklyn's Vanderbilt Avenue, slowing down speeding traffic and improving safety through changes to street geometry. When faced with the question of how to fix a dangerous street, the first instinct of many New Yorkers is to call for the most familiar symbols of regulating cars: the stop sign and the traffic light. Nothing, they think, could more effectively force dangerous drivers to stop speeding through their neighborhood than these familiar red symbols. Just this month a community group in Manhattan Beach, Brooklyn asked the city to remove a bike lane and zebra stripes from Oriental Boulevard — measures that have a real traffic-calming effect — and add a new traffic signal where the road intersects with Falmouth Street. But stop signs and traffic signals are usually ineffective, even counterproductive, if the goal is to make streets safer. Sometimes, the demand for traffic control devices is driven by good intentions, as when City Council Member Karen Koslowitz urged the city last year to stop treating Queens Boulevard “like it’s a highway” and instead make it a “pedestrian-crossing street.” Koslowitz was calling for a new traffic light at the intersection of Queens Boulevard and 80th Road. Other times, it’s part of an attack on more effective traffic calming measures. During Dov Hikind’s epic tirade against NYC DOT at a Brooklyn Community Board 12 hearing last December, the assembly member contrasted the construction of pedestrian refuges on Fort Hamilton Parkway with his long campaign to get a traffic light installed elsewhere in his district. “You know, because you live there, you know how dangerous that corner is. I had a situation on East 4th and M, where people died, and the Department of Transportation turned down the traffic device four times,” said Hikind. Eventually he prevailed and a traffic light was installed at the location. These fights — which local politicians apparently relish — can last years. Together, Peter Vallone Sr. and Jr. fought for a traffic signal at 21st Street and 30th Drive in Astoria for 41 years before a light was installed in 2008. Requests for stop signs or traffic lights are so common that the City Council recently passed a law requiring DOT to explain to community boards and Council members why it rejects them. Each case is different, but in the aggregate, the reason traffic control devices aren’t installed more frequently is quite simple: They tend to make streets less safe, not more. Reid Ewing, a professor at the University of Utah, literally wrote the book on traffic calming — the Institute of Transportation Engineers’ Traffic Calming: State of the Practice. “They’re good for traffic control,” said Ewing of stop signs and traffic lights. “They’re not so good for traffic calming.” In other words, they help make traffic flow in a more orderly fashion, but not necessarily in a safer one. “We kind of panned stop signs as a traffic calming measure,” continued Ewing. “They don’t do a lot for speeding, because there’s a tendency for drivers to make up for the lost time.” That can lead to increased speeds midblock. Ewing did say that with enough stop signs, drivers will avoid a street altogether, reducing the number of cars but not the danger of each one. Schwartz recalled a study he worked on while at DOT. A number of traffic signals that did not meet federal guidelines had been installed when local residents demanded them. “Statistically, crashes went up when traffic signals were introduced as a result of political pressure rather than the warrant,” said Schwartz. According to that report’s executive summary, crashes rose by 65 percent where unwarranted signals were installed. Schwartz pointed to Queens Boulevard, where he said signal retiming has helped pedestrians make it across the so-called Boulevard of Death. “It can work,” he said. 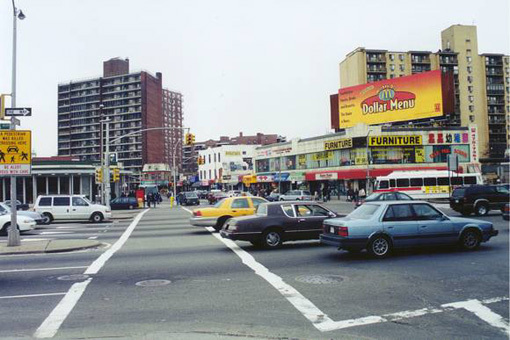 Even on Queens Boulevard, though, Schwartz said a change to the design to the street’s geometry would have been preferable. Signal retiming also carries drawbacks like potentially increased traffic congestion and more rear-end crashes, said Schwartz. Biggest single danger to pedestrians is turning vehicles. Motorists turning on a green light are no more likely to yield to a crossing pedestrian (some studies say less likely) than those turning at an unsignalized intersection. We have this thing we call “science” and applied science or “engineering.” We can actually measure how different street designs work in the real world. Some things work better than others. DOT could do a better job of publicizing the stacks and stacks of studies that have been about this stuff. Traffic lights also increase noise, as vehicles idle for the light to change and play music or just have noisy diesel engines. Guest — but didn’t you get the memo… This is NYC and we’re painfully special here. All of those studies are *somewhere else* and obviously wouldn’t work in New York. The only times I’ve seen the heinous five way intersection outside our house work really efficiently and safely has been during various power outages. Otherwise it’s a nightmare. The problem is that this argument is counter intuitive. Taken together with the fact that changes in street geometry usually take a long time, the community is going to be unhappy if a traffic signal, which appears to be a quick solution, is rejected and they’re told that street changes may be done several years from now. Wow, the timing of this couldn’t be better. In another thread, I was mentioning exactly this-that traffic lights are over used and frequently create more problems than they solve. Moreover, they’re not intelligently done in that they often force users to wait when nothing is there. Traffic sensors and push to cross buttons can easily fix that, but the city seems averse to both things. Studies show that the more any traffic control device is used, the more casually it tends to get treated by road users. NYC has 11,871 signalized intersections, which in my opinion is 10,000+ too many. NYC should have a fixed maximum number of traffic signals, perhaps in the area of 1000 to 1500, for many reasons, including budgetary. Once that maximum is reached, a signal must be removed somewhere if one is installed somewhere else. There are other ways to prevent conflicts at intersections, including reducing driving speeds to ~20 mph, and also having a long-term goal of reducing motor traffic volumes. London went on a traffic light diet not long ago with no ill effects. NYC should do the same. This is one area where both motorists and cyclists can find common ground. If we really want slower driving speeds and safer streets, then start by narrowing roads so motorists don’t feel safe driving at more than 20-25 mph. This is a low enough speed that most intersections can be dealt with via a yield on the side street, with the main road given right-of-way. Where arterials intersect, if room permits, use traffic circles rather than signalizing. The advantage of a traffic circle is a person crossing only has to deal with one lane of traffic in one direction. As such, it’s relatively easy for them to find a gap long enough where they can cross without using stoplights or pedestrian signals. That 5-way intersection mentioned by krstrois would likely be a perfect candidate for a traffic circle. Doing all the things I mention should be coupled with an education campaign. Motorists may object to 20 mph speeds initially but 20 mph and seldom stopping may result in faster trip times than bursts of 40-50 followed by sitting at lights. We need to educate them on this fact so they work with the system. Cyclists of course would welcome any removal of traffic lights. 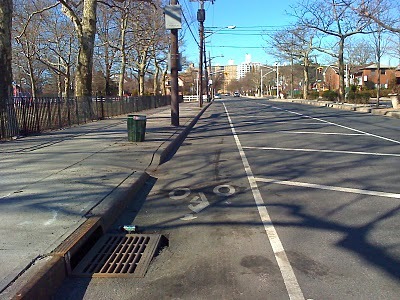 In my opinion, they’re the single most unpleasant, annoying thing about cycling in NYC, bar none. For every one which might give me slightly faster passage through an intersection, there are 2 or 3 which require slowing or stopping. Overall they impact trip times and turn cycling from a smooth, steady activity into one with constant, irritating speed changes. Anyway, it’s high time the issue of overused traffic controls was seriously looked at. I’ve noticed traffic lights proliferating like mushrooms ever since the Guiliani administration. One local street with a bike lane went from 4 lights in a one mile stretch to 9, none particularly well coordinated. On another, 3 lights were stuck in between two others which were spaced only 1/4 mile apart to begin with. And the worst are the lights stuck in the middle of a block, or on one-way streets which lead only away from the main thoroughfare (hence no possibility in either case of cross traffic). If these are there solely for pedestrians to cross, then why aren’t they controlled by push-to-cross buttons? Why have them needlessly go red every cycle, often forcing drivers to stop for absolutely nothing? It’s been proven that you can’t moderate traffic speeds via signals or stop signs. If anything, they make things worse by making drivers more aggressive. It’s time to seriously rethink how we control traffic. This is clearly a case where less equals more. Let’s get drivers and everyone else thinking and watching again. This is really the path to safer streets. i wouldnt suggest removing traffic lights in most parts of manhattan. the crosstown grid system actually does work. i do think there are many parts of queens brooklyn where traffic lights are overly used. 3 way intersections are the best example of traffic lights being removed. replaced with yield signs on all directions. yield in the following order. pedestrians first. then motor vehicles/cyclists. Oh, and one more thing to add to my previous post. Community boards and other groups of laypeople shouldn’t have any input at all into the solutions for any problems. Rather, they should simply be able to tell DOT such and such street has a problem with speeding, etc., and DOT should implement the best solution. The idea of community boards “requesting” traffic lights or stop signs is ridiculous on every level. It’s like a patient telling a doctor which organs to operate on, or which pills to prescribe, when they’re sick. Let the experts do the job they’re paid to do. That’s why we have these experts. Laypeople just aren’t qualified to know what works best on a subject as complex as traffic engineering. The fact that unwarranted traffic signals were installed at the behest of community boards has been obvious to me for some time. In the future we must look at every single traffic signal, and remove those which wouldn’t have been warranted by the standard criteria. This won’t go over well with community boards who may have fought for years for a traffic signal or stop sign, but that’s where education comes in. Show them via data that the signal either made things no better or even worse, so that’s why it’s being removed. And NYCDOT really needs to have a procedure where citizens like me can report and request that traffic light warrants at certain intersections be reexamined. I can easily find about two dozen lights within a mile of me which probably never should have been installed in the first place. It only works in Manhattan because most traffic is North-South. You can optimize the signals so motorists traveling along the avenues rarely need to stop. The problem though is signal timing optimized for motor traffic speeds means cyclists barely get two or three blocks before being forced to stop at yet another light. The only solutions to this problem might be having a bike-only avenue (with no lights at all), or elevating the bike lanes over everything else. I’m still of the opinion though that you can get rid of most of the lights in Manhattan. Do you really need a light along the avenues at every single intersection? Most cross streets have so little traffic that stop signs will do. And pedestrian bridges can be installed every few blocks to cross the avenues. It’s a better solution which works for all three groups, as opposed to traffic lights which actually work against cyclists and pedestrians. I’ve heard these explanations for the past few years, and the arguments generally sound compelling. I have difficulty, however, reconciling my daily observations with a pair of streets between my home and my subway station. It is a one-way pair, but one street has a stop sign while the other has a signal light where they cross the same street. (I suspect the signal light was installed because there is a school on that corner.) Day after day, I pay attention to these intersections. Drivers do speed up to beat the red at the signal light. At the stop sign, however, there is a chronic problem with drivers failing to yield to pedestrians. For years, all the near misses I have seen have been at the intersection with the stop sign. It leaves me wondering about the distinction between speed and yielding… The car trying to beat the red light is predictable. All the pedestrians I see, including the kids, know enough to watch for them. Often you can hear the engine (although electric vehicles could make that more dangerous in the future…). The livery cab drivers who blow through the stop sign, though, continue to feel dangerous. Speeding is clearly not good, but I’m not sure a speeding car that doesn’t hit anybody is as dangerous as one moving a little slower that hits a mom walking her kid. One of these days I guess I’ll need to roll up my sleeves and dig into some of these studies a little deeper and maybe do some field work of my own to make a little more sense of this issue. Guiliani shouldn’t have had any input, either. He didn’t work for DOT, nor is he versed in traffic engineering. Like I said, leave it to the experts-namely the foot soldiers who work for NYCDOT as traffic engineers. This is clearly an area neither community boards nor politicians should get involved in except in a very general way (i.e. set the overall goal, but leave the specifics to DOT). i like the idea of pedestrian bridges. but the problem with stop signs at cross streets are that all of manhattan’s N/S avenues are 4 lanes wide. that makes it difficult, if not very dangerous to have the cross streets with stop signs. the mid crosswalk intersections would work if pedestrians actually followed the rules. but as being in NY, nobody does, and the implementation of the mid crosswalk becomes silly. Pedestrian bridges would be barriers to weaker pedestrians (the elderly and infirm) and would punish all others. If you want to make even more enemies for the cycling movement, continue in this vein. im assuming you are talking about pedestrian bridges that are only accessible via stairs. yes, we can have stairs as an accessway to these, but think ramps too. btw: other cities like tokyo, hongkong have pedestrian bridges and last time i checked, there were older folks there as well. Yes. In fact, with a skypath you can put building entrances at skypath level, minimizing the need to go up and down ramps. But yes, money is really the primary issue, although in my opinion the skypaths will save more money in terms of saved time/injuries than they’ll cost. Given pedestrian volumes in New York City, there should be neckdowns at every intersection within a quarter mile of a subway entrance. Stop signs where I live are a complete joke. There are three stops signs on the street behind my building. I’d say about a quarter of drivers actually come to more or less a complete stop (“or less” because often wheels are always turning at least a little bit but the drivers are being basically responsible and following what I thought everybody learned in Driver’s Ed). About half of drivers slow down somewhat, enough so that they feel they can have enough time to look around for other drivers or pedestrians in the intersection, and stop if they see one. And about a quarter of drivers just blow clear through the stop sign as if it wasn’t there. Just today, I was in the crosswalk about to step foot into the path of a driver, but he didn’t slow down. As he drove through the stop sign I had to yell at him through his open window for ignoring the stop sign. Not a great way to start the day. Stop signs won’t do very much but give a pedestrian a false sense of security. I wish I agreed that speed bumps worked! I live in front of one on a 1.5-lane city road and enjoy the sounds of cars scraping over them going at least twice the posted 15mph speed limit (if not faster). The street is already super narrow, I don’t know what else to do to prevent speeding! i hate speed humps. it causes a lot of unnecessary braking and accelerating contributing to poor fuel economy, accelerates wear and tear on the car. they dont work as drivers speed up immediately anyways. and yes, the scraping. probably better off installing a row of rumble strips along the entire street. good example of why this works is the few remaining cobblestone streets that are unpaved in soho. the road service is uneven enough that going over 15mph is insane. Joe R.: You are funny. Keep it coming. I see this every single day out my front window in Chicago. I live on a moderately busy sub-arterial street, with an all-way stop a block and a half north, and a streetlight at an intersection with a class 4 neighborhood collector a half block south. Motorists are generally pretty good at coming to a complete stop at the stop sign, but they then do race to make the light. The same thing goes on the collector, and there have been too many crashes at that intersection for me to count since I’ve lived here. Signalized intersections carry special risks. Drivers often accelerate during the yellow phase to "beat the light," leading to high-speed crashes. Federal officials warn that improperly placed signals can "significantly increase collisions." So Seattle is reviewing 10 intersections to see if traffic signals should be replaced with stop signs. The DOT put lights at the corner of Hoyt and President streets in Brooklyn, an intersection at a public school (!) that has neither a traffic signal nor a stop sign.